Today I’m working on drafting up some follow up communications and cover letters for a client, for sending out her resume and following up post-interview. Though it may seem more like a formality than anything, it’s such an important piece of the process. A good, solid follow up letter not only demonstrates professionalism and follow through, but it’s also an important opportunity to reaffirm your interest and get back on the company’s radar. The same goes for the communications you use to market your resume and application. If I had a penny for every time I received an email as a recruiter with a resume attachment improperly named, accompanied by 1 line of text (and sometimes not event that), well, I’d have a lot of pennies. Think of it like this – do you just walk up to someone in a networking or professional setting, throw your business card in their face, say “Here you go,” and walk away? Absolutely not. This email is personalized and makes a welcoming introduction to the candidate herself, giving me information on who she is, what she does, and what skills and experience she brings to table. She’s done something very important here, which is pre-qualify herself for the position, which also saves me time and effort. She gives me a very brief overview of where she is currently, and why I should want to learn more about her, since she appears to be strongly regarded and accomplished in her field. Her resume file is appropriately titled with her name, and the title of the position for which she is applying. Also remember to include a relevant subject line for your email that mentions your name and the position you are applying to. 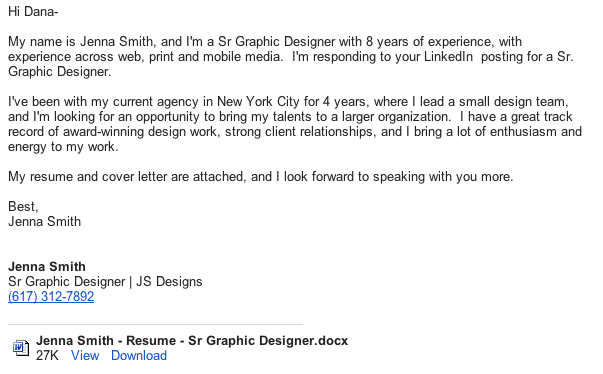 Based on this email, her subject line would have read: “Jenna Smith – Sr Graphic Designer – 8+ Years Design Exp”. Notice I threw in the little bit at the end as a sneak peak of what’s to come? 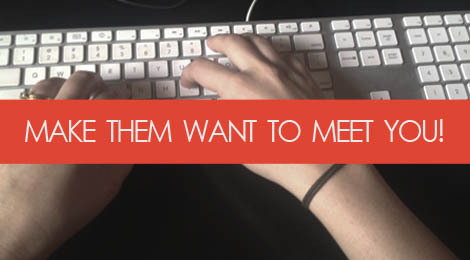 This is pre-pre-qualifying the candidate, and increases her chances that in an inbox full of 100 submissions, hers is much more likely to stand out and be opened. So here’s the pop quiz – who do you think got called in for the interview? Tags: career, communication, cover letters, email, follow up, looking professional, professionalism. Bookmark the permalink.